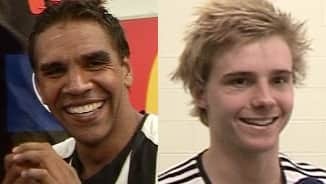 Andrew Krakouer bagged four goals in Collingwood's thumping of Fremantle On This Day in round 23, 2011. Collingwoodfc.com.au dissects Andrew Krakouer's third and final season at the Westpac Centre. Could well have been the story of 2011 had the Magpies been able to secure their 16th premiership against Geelong. The nifty small forward's rise from a prison sentence to reborn AFL star was eye-catching, with his twinkle-toed style of play instantly installing him as a fan favourite. Although his 2010 form for Swan Districts was built in the midfield, Krakouer was a stay-at-home forward pocket for most of 2011. Former Richmond coach Danny Frawley claimed he was the player most likely to win a Brownlow Medal "if football was played in a phonebox", such is Krakouer's ability to be clean in congestion. There's no shortage in competition for the small forward's role at Collingwood, but Krakouer will take some dislodging. Made a fine return to AFL football, playing 23 of the 25 matches and kicking a career high 35 goals. His inclusion released Leon Davis to the backline where he was named in the All-Australian team. Played in the side’s NAB Cup premiership in the pre-season, and complied an impressive highlights reel as the year progressed. Won Mark of the Year for his hanger over Adelaide’s Luke Thompson and teammate Dayne Beams in round nine. Bagged four goals twice (rounds 19 and 23) and laid 78 tackles. Was one of the better performed Magpies on Grand Final day, kicking three goals in the first half and setting the side alight before Geelong reined him in. Returned to the WAFL, playing for Swan Districts. Had a superb season, winning the Sandover Medal (as the best and fairest player in the league), and the Simpson Medal, as best afield in the Grand Final. Krakouer’s performance in the 2010 WAFL Grand Final has already gone down in football folklore, gathering 42 disposals and kicking four goals. He singlehandedly won his side the game, kicking the match winner with minutes remaining. His fairytale was completed when he was pre-listed by Gold Coast during October, and then traded to Collingwood (along with Murray Bushranger John Ceglar) in exchange for selection 25. Was not permitted to travel to Arizona for the Magpies’ training camp following the USA’s failure to approve his visa application due to USA immigration laws. Played football in Perth’s Mercantile Football Association for Wooroloo Prison’s football team. In one match, Krakouer kicked 16 goals. He was released from prison on parole in August. Returned to Perth and was jailed for 16 months following the incident in Perth, 2006. Found the season a struggle, playing only nine games and hitting the scoreboard in only three of them. Bobbed up with three in the loss to Collingwood in round three, but was omitted after round nine and reappeared only twice more before his delisting. His final game for Richmond was against Sydney at the SCG in round 17. As the Tigers floated around the edges of the top eight, Krakouer hunted down 19 goals from the forward pocket but didn’t set the world alight. Was dropped for a fortnight after round two. A solid end to the season, with six goals in his last three matches, provided hope for a breakout season in 2007. Was charged with assault while in Perth in December. Had a productive year, peaking with five majors in Richmond’s 85 point thumping over Carlton. Received his first Brownlow votes for his 17 disposal, one goal performance against the Bombers in round 15. Played all 22 games for the first time in his career, averaging nearly a goal a game (20 in total). Broke the 20 possession mark for the first time, but found goal scoring opportunities hard to come by in a side that won only four games. Caught the eye with a five goal haul in round seven against Essendon, and ended the season with 22 goals, kicking multiples on seven occasions. Tapered as the year wore on. Began the season well with two goals against Collingwood in round one, but it proved to be his only multiple haul for the year. Didn’t register a double-figure possession count in 13 games, but kicked one of the goals of the year against the Kangaroos in round 11, dribbling a goal from the tightest of spaces on the boundary line. Made his debut for Richmond in round seven against Essendon in front of 77,576 at the MCG. Impressed with two goals, but was omitted after round nine and did not reappear.